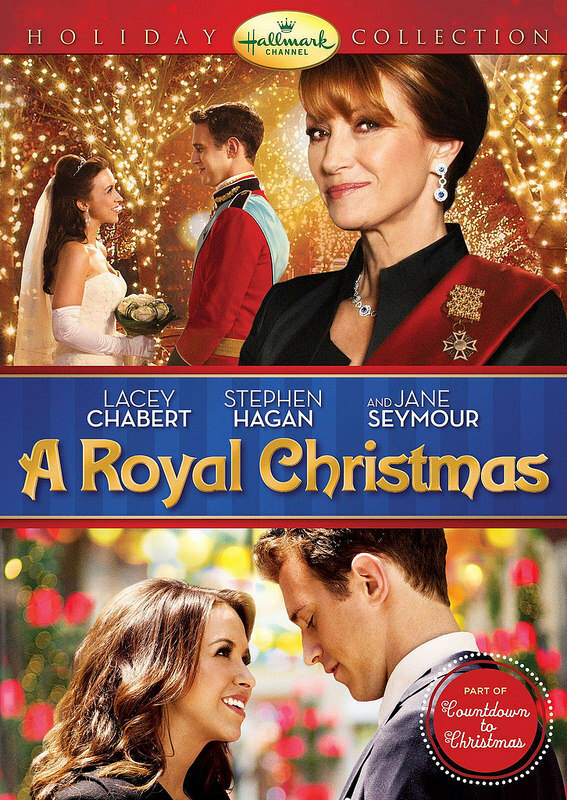 Hallmark has returned for another Christmas title. This one brings a royal air to the mix and we get a lot of new scenery compared to the first two films which is nice. I still say that the first Hallmark film I saw was the best one and this one also loses to the second, but don’t think that the series is already starting to decline. The first two films just set a rather high bar and this one is still roughly at that same level. The main character can just be a bit annoying again. The film starts off with Emily having a good time. She is going to be spending her first Christmas with Leopold so naturally she is looking forward to it. Unfortunately, he chooses this time to drop a landmine on her. He is actually a prince and must get ready to inherit the throne. Emily is really upset at this since it’s a rather big secret to have been kept for so long but he assures her that he is the same person. To test that out, he wants her to come with him to the kingdom. Emily does so but quickly learns that Leopold’s mother Isadora is very against their relationship and will do whatever she can to destroy it. Can Emily stay strong or will she be humbled? Most of the positives in this film mirror the last two. The writing is pretty solid and the film’s pacing is on point. You won’t be bored during the adventure and the film makes sure to steer clear out of any serious negatives. The scenery looks really nice and it’s just a pleasant film to watch. There’s no reason to cringe or turn away except for some decisions at times. This film does have less positives in general though which is what hurts it a bit. For starters, the supporting cast isn’t nearly as impressive here. Emily’s Dad can be a bit over the top and comes off as more annoying than supportive like when he forgot that his camera was off during the final scene and basically spoiled the moment. Emily’s friend isn’t quite as helpful as the sister was in the last film and doesn’t really get to do much in general. Then you have the maids who turn on Emily a little too easily. They get along at first, but then Isadora decides to sack them to get at Emily and they quickly go into the guilt tripping tactic. Considering that they knew the rules and that Emily certainly couldn’t have been aware I don’t see how they can blame her. They come around by the end since the head butler re-enlists them but it’s hard to really like these guys. Of course getting fired is emotional and it was in the heat of the moment, but the point still stands. As for Emily, she is a little too sensitive. She falls for every trick in the book and gets very easily offended. Just having the Leopold’s ex explain how close they are is enough to put her on edge. At times she tries to put on a brave face but it cracks with ease. In this situation everyone made it abundantly clear from the start that there would be several people trying to break her and Leopold up so Emily doesn’t have the excuse that she was unprepared. She knew exactly what she was getting into. Emily also decides to cut ties with Leopold so as not to be a bother but instead that just comes off as her giving up way too easily. If she is really serious about this relationship then she simply needs to keep on holding tight. Meanwhile Leopold could certainly have done better as well. He basically lets Isadora walk all over him and to a large extent it’s fine. She is still his mother and he has to keep up the family legacy. That being said, there are some things he could have done better like not agreeing to go on a horse walk in the morning when Emily can’t ride. Alternately he could have rode with her since two people can ride a horse. I can’t really take too many points away from him though since Leopold does a much better job of actually going after Emily repeatedly rather than giving up. Meanwhile Isadora is the main antagonist of the movie and does a good job in the role. She puts a lot of thought into her plans of getting Emily away. She always has the edge in this battle of wills. Naturally you can probably see where her character arc will go from the start, but she was still convincing up until that point. She also took her share of risks like approaching Emily while she was holding a sword. Some things may be a bit much like when she puts Emily on the spot both at a party and in the middle of many prestigious individuals. Wouldn’t it reflect poorly on the family if the Prince’s girlfriend is low class? Isadora should try to get rid of her privately, not publicly. There is also the ex, but she gets less of a role than you might expect. Not only does she not have a chance from the start, but she doesn’t even feel as mean spirited as some of the others. She doesn’t actually do anything to Emily which is nice since sometimes bullies should be a little more subtle. Also, it’s not as if she is typically a bad person, she is basically acting under orders. That’s no excuse, but she was certainly not as bad as she could have been. With Emily giving up so easily that also doesn’t help the main heroine’s case. Overall, The Royal Wedding is a fun film. I don’t think it is quite as strong as the last few films but it’s still a good watch. The Butler can be fun as he constantly talks back to Isadora. At first you’ll wonder why he hasn’t been fired yet, but there is a big plot twist that certainly explains this rather satisfactory. It could have been better, but I still recommend this film nonetheless. As long as you are looking forward to a fun Christmas (Well, it barely feels like one at times) comedy and you can get past the romance then this is a good film to check out. You’ll likely roll your eyes when Leopold first lets Emily know that he is a prince since the odds of that are so slim, but that’s a natural response and you’ll be able to get back into the movie after that scene. It’s time to look at a very old film. This title came out before Star Wars, Godzilla, and even Twister. I haven’t seen many films from the 1930’s so it was cool to see this one. I’ve always thought that the writing in the older generations was better so a film about an average day more or less for the main characters would be more interesting in the 1930’s than for a 2000’s film. After all, it is fun to see how people used to spend their days and how refined the English Language was. The title is fairly accurate as to the plot of the film. A group of rich people all head to a large mansion and are intent on having a good time. Things get a little worrisome when the host is visited by Death, who has decided to take a holiday. He won’t be performing his usual duties while on vacation as he wants to learn why people fear him so much. The host reluctantly agrees to let him join in on the festivities and Death warns that if any of the mortals find out his true identity…they’ll all have to die! The film’s quite enjoyable which is always a good thing for a movie. Ultimately, you want to have a good time watching it and the film succeeded for me as I never grew bored. As I mentioned, it’s essentially a slice of life film as Death ponders some deep questions about life, but the film is completely dialogue based. Don’t expect any long chase scenes or anything like that. To an extent, you could also call it a bit of a romance film between Death and the main heroine, Grazia. It’s an old school romance so it’s played out better than 90% of the modern ones. They don’t actually start kissing or acting as if they’ve known each other for years. Rather, it’s played more delicately and the moral involves looking beyond the exterior when in love. It’s a good message and handled well. That being said, I didn’t care for Grazia. She was rather vague at times and couldn’t always seem to make up her mind. She definitely kept her allies confused the whole time and I’m sure that they were very puzzled as she would faint and practically invite death as she goaded her friend into driving very quickly. You’ll possibly feel bad for the guy as he wanted to be with her, but was quickly friend zones. Grazia even said that she loved the guy…as a friend. That was probably one of the best moments in the film and I still say that it should happen more often. Death isn’t a great main character as he is not very smart in the ways of humans so he is always slow on the uptake. The plot of an alien or concept trying to learn Earth customs has never been my favorite. Death tries to get the hang of things, but I feel like he should have a better understanding of Earth since he’s always creeping around. Evidently, you don’t learn how to be subtle while sending people to their graves. The host was probably the best character as he did try to shoot Death. While he may have lost his nerve after that, he started out strong and he was one of the more reasonable characters, it’s just too bad that he was so scared. Of course, you could say that about the whole cast as they were petrified of Death. Even when they thought that Grazia was in danger, they didn’t step in to help her. Fearing death is a little overblown here as the heroes should be willing to risk death to save their friend. Especially the guy who wanted to be Grazia’s boyfriend, he simply backed down when he should have tried to press on. One part of the plot that was fairly humorous was the fact that nobody could die since Death was on vacation. The film showed various disasters where people should have died and then the newspaper would say that everyone survived. That was neat and certainly fun as the heroes would wonder what was happening. Those people must have been very lucky eh? The most unbelievable for the heroes was the guy who jumped off of a skyscraper and just got back up. I wonder if he got any injuries or if “dying” resets you back to normal. It’s interesting to think about. The film’s fairly short as it is just a little over an hour. It makes for a very quick watch. The film was good and there isn’t a whole lot of negatives to say about it. The main cast could have been better, but at least the unlikable characters here are still far better than the average unlikable characters from the modern films. One negative would probably be the plot where two of the characters are constantly flirting with Death as it does come across as a little unnecessary, but it’s not too bothersome. It’s just around and then it fades away. 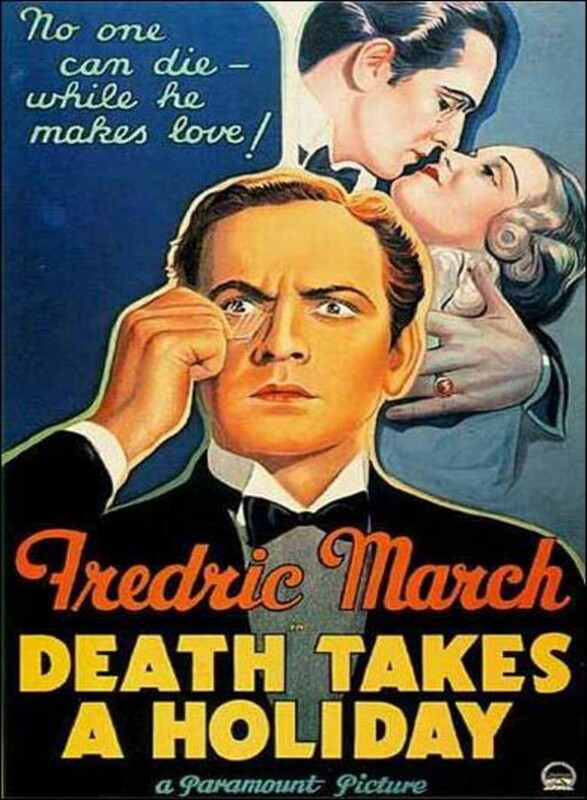 Overall, Death Takes a Holiday is a solid film. The scene where the host is warning everyone not to upset Death was fun as there was a lot of tension in the air and it had a similar effect as if he had told everyone that the guy was Death anyway. Thinking about a world without Death is interesting, but the world would be overpopulated very quickly and the world would be in a state of ruin. The film briefly touches on that and the concept of what happens after Death as well. For Christians like myself, Death holds no sway as we have Heaven to look forward too. This film shows that without such a firm belief as to where you go after Death, Death itself has a lot of control over the individual. In the remake, it would be fun to see a Christian character and how they would interact with Death. That would add a whole new layer to the experience. Either way, I definitely recommend this title. It’s almost a century old, but holds up quite well and is as enjoyable now as it was back in the day.